Concord grapes are as American as apple pie--they are the most successful grape in North America since the 1800s. Concord grapes grow large, round and deep purple, filled with juice. This grape variety was named after being discovered growing wild in Concord, Mass. When growing these grapes, it is important to understand that they have an early harvest time and need specific care. Although this is a hardy grape variety, it cannot be grown in all climates. It is most commonly planted from the Rocky Mountains to Minnesota. Support young Concord grape vines with wooden stakes that are firmly pounded into the ground with a mallet, securing them loosely with twine. 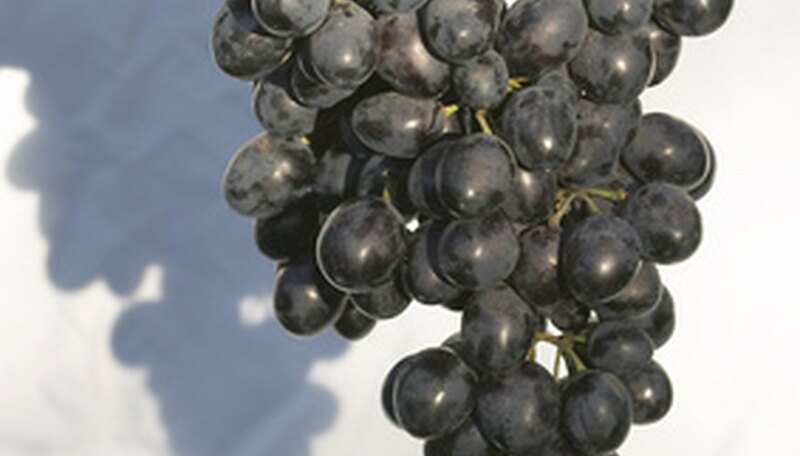 Fertilize Concord grapes with a 16-6-8-type fertilizer. (Follow the package instructions to see how much to use for your planting space and application times.) Nitrogen-based fertilizers are best for grapevines. Prune back any dead or broken vines or canes at any time, particularly the first year. In the second year, prune back all the side growth to the one main cane that is the strongest. Water Concord grapevines heavily and deeply, about once every week in dry climates and once every two weeks in moderate to coastal climates. Make sure not to overwater, so if you notice that the leaves start to shrivel or turn yellow, cut back on watering. Train concord grapevines on a trellis starting in the second growing year. Do this by inserting an arbor or trellis adjacent to the grapevine and about 6 to 7 inches away from the base. Weave the vines or branches through the trellis or secure them with loose twine. This will encourage the vines to climb upward and outward and make pruning easier. Fertilize in spring of every year after the third growing year. Prune back all the side growth during the third year except for the main cane and the two strongest and most thick branches, one on each side. During the fourth year, about 12 buds will sprout from each arm. These are called renewal buds. These will eventually produce the fruit harvest. From here on out, just lightly prune the Concord grapes to keep the basic framework of the grapevine, with a main cane and two sturdy side arms.